Online Photos Albums with automatic generation of thumbnails. Notice : This project is now closed..
Main User Screen with a popup with file infos. Directory in administration mode (Info, Delete directory, click to view). Directory Informations like files,subdirectories number and last modification date. 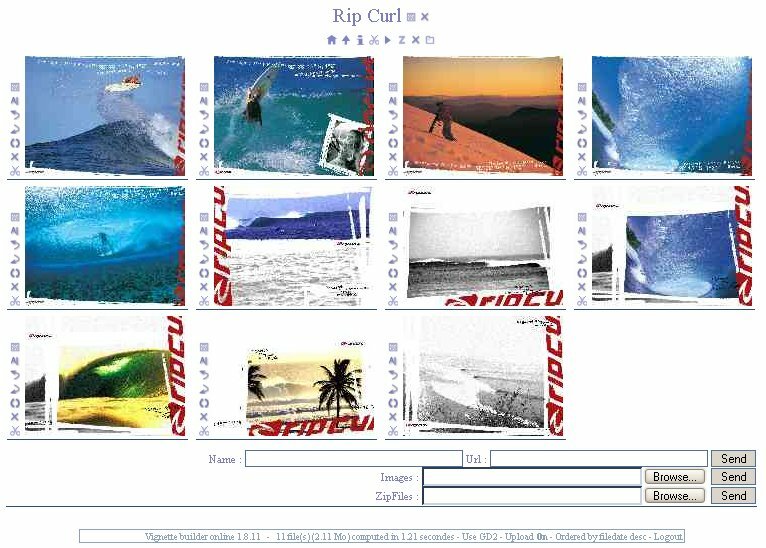 Admin Screen. Note : Rotate function aren't available on this server. Page number, can be positionned on top and/or bottom of page. Rename a file and linked file (thumbnail and description). Use GD 2.0 or GD 1.x (choise was automatic in config file). Gif are resized in html when using gd2. Use Exif (Only available in PHP 4 compiled using --enable-exif). Modify $main_login=""; and $main_pwd=""; in config.php. Add $admin=1;session_register('admin'); in index.php to bypass login/pwd. Configure some options like thumbnail size or exif infos. Search in name or description. Want more ? so .. email me. Not a bug just a notice ; First load on remote link produce reduced thumbnail not proportionnal. Same bug as above for gif with gd2, thumbnail could not be generate. 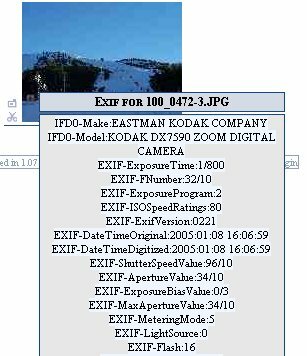 While rotate a jpg, exif data was not maintain, a new rotate function or a exif.copydata method must be write (thks to Eliseo Franco for report). Billa for great features ideas. Phil for some idea and debug. Eliseo for support and bug repport. And all other to use it.